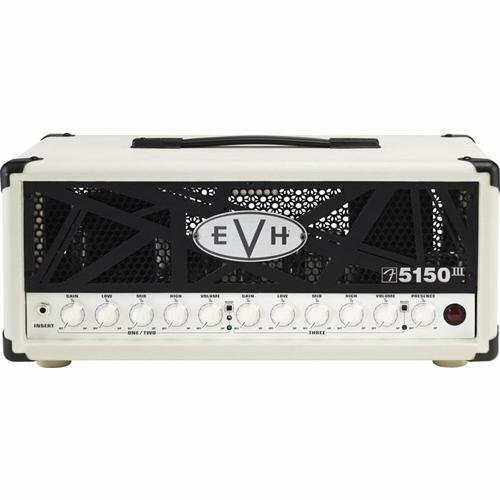 EVH 5150 III 50-watt Tube Head - Ivory by EVH at Worst Album Covers. MPN: 2253000410. Hurry! Limited time offer. Offer valid only while supplies last. The EVH 5150 III Mini 50W Head is a little monster. With seven 12AX7s and two 6L6s, the 5150 III Mini puts out 50 watts into 4, 8, or 16 ohm loads. The EVH 5150 III Mini 50W Head is a little monster. With seven 12AX7s and two 6L6s, the 5150 III Mini puts out 50 watts into 4, 8, or 16 ohm loads. You get three channels, along with major tone-sculpting control. Dial up spanking cleans for rhythm work, hit the included footswitch to call up tasty crunch, then hit it again for face-melting lead tones. For massive tone and monster volume with a compact footprint, the EVH 5150 III Mini 50W Head is your weapon of choice.